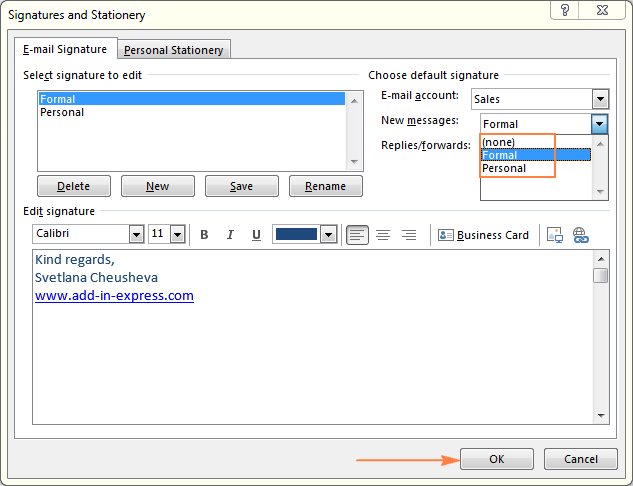 This tutorial explains different aspects of Outlook signature. 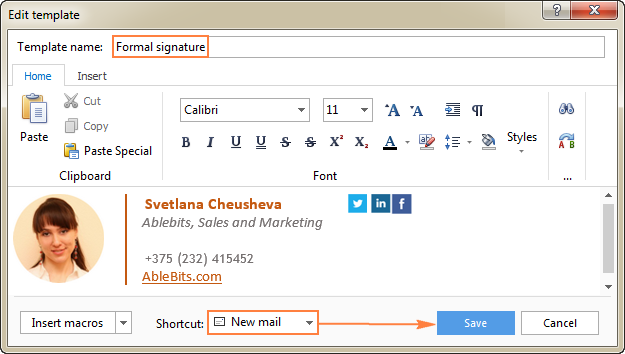 You will find the detailed steps to create and change signature in Outlook, add a signature to all outgoing emails automatically and insert it into a message manually. Also, you will learn how to make a professional Outlook signature with an image and clickable social media icons. If you often communicate with your friends and family, and especially if you conduct business via e-mail, your signature is one of the most essential points of communication. They say the first impression is important, and so is the last, because a positive last impression is a lasting impression! Over the web, there exist numerous articles, tips and special tools to create a professional email signature. In this tutorial, we will focus mostly on practical "how-to" guidelines to create, use and change a signature in Outlook. Somewhere between the lines, you will also find a few tips to make personalized, informative, and attention-getting Outlook email signatures. 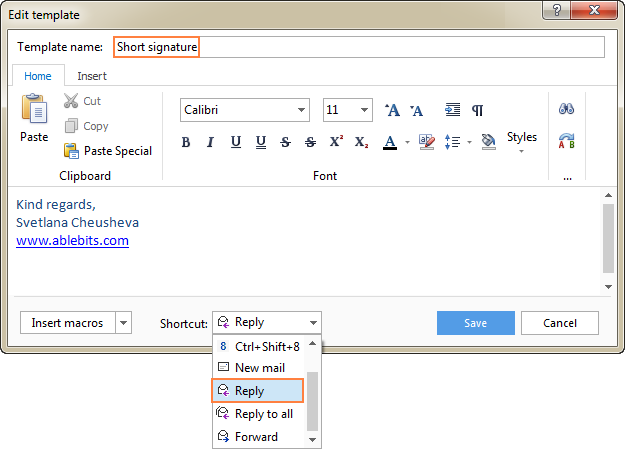 Creating a simple signature in Outlook is easy. If you have a few different e-mail accounts, you can set a different signature for each account. Also, you can automatically add a signature to all outgoing messages, or you can choose which message types should include a signature. 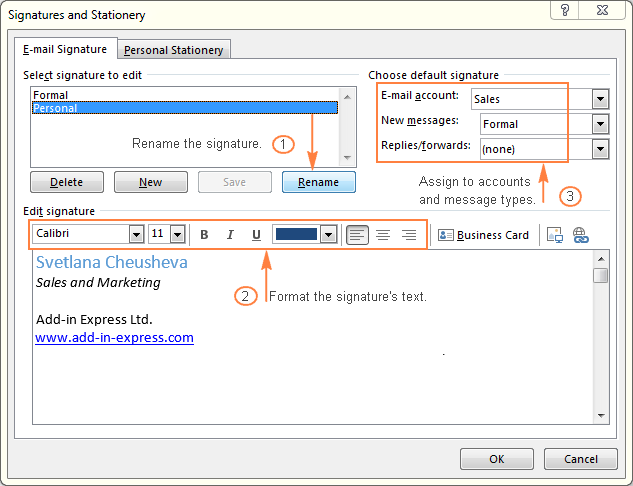 To set up a signature in Outlook, perform the following steps. On the Home tab, click the New Email button. And then click Signature > Signatures… on the Message tab, in the Include group. 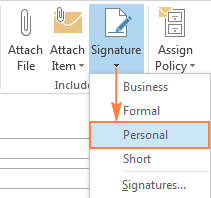 Another way to access the Signature feature is via File > Options > Mail section > Signatures… in Outlook 2010, Outlook 2013, Outlook 2016, and Outlook 2019. In Outlook 2007 and previous versions, it's Tools > Options > Mail Format tab > Signatures…. 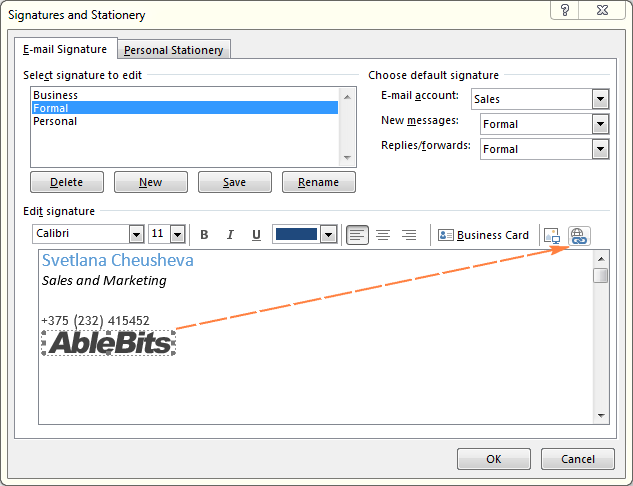 Either way, the Signatures and Stationery dialog window will open and display a list of previously created signatures, if any. 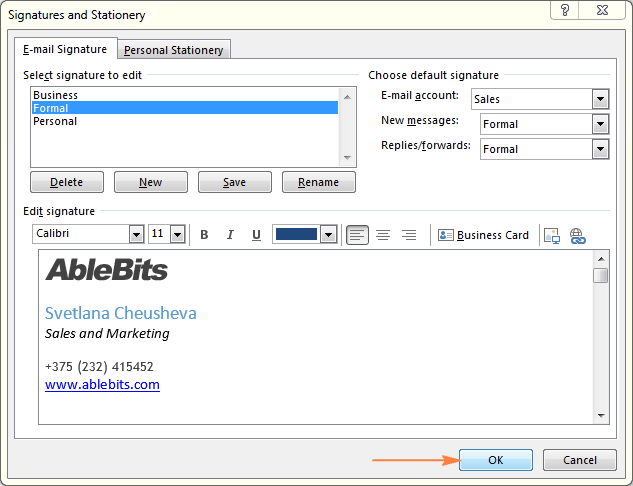 To add a new signature, click the New button under Select signature to edit, and type a name for the signature in the New Signature dialog box. In the E-mail account dropdown list, choose an email account to associate with the newly created signature. In the New messages dropdown list, choose the signature to be automatically added to all new messages. 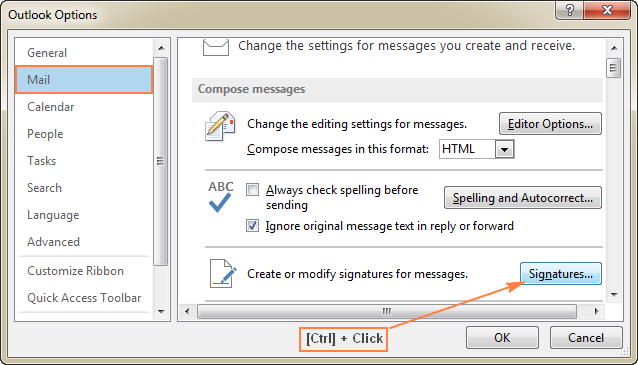 If you don't want Outlook to add any email signature to new messages automatically, leave the default (none) option. From the Replies/forwards list, choose the signature for replies and forwarded message, or leave the default option of (none). 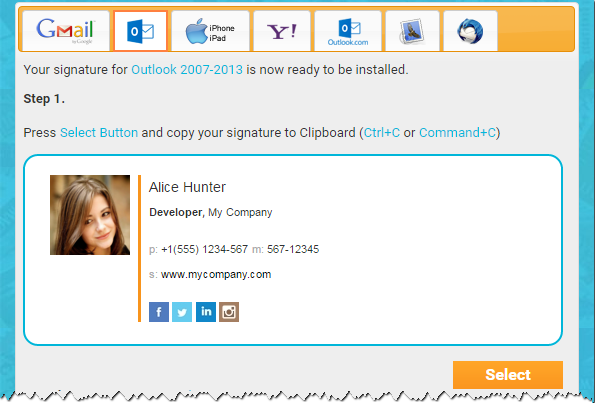 Type the signature into the Edit signature box, and click OK to save your new Outlook email signature. Done! In a similar manner, you can create a different signature for another account, for example one signature for personal emails and another for business emails. Tip. This example shows a very simple text signature just for demonstrational purposes. If you are creating a formal email signature, you may want to design it in a business-like way, and include a clickable brand logo and social media icons. You will find relevant information and the detailed steps in this section: How to create a professional email signature in Outlook. Microsoft Outlook allows you to configure the default signature settings so that a selected signature will be added to all new messages and/or replies and forwards automatically; or you can insert a signature in an individual email message manually. If you've closely followed the previous section of this tutorial, you already know how to have a signature automatically added to new messages, replies and forwards. 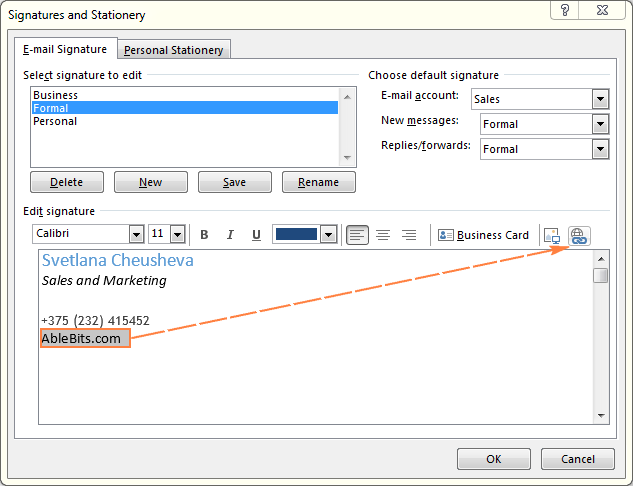 All you have to do is to select the desired default signature(s) for each of your accounts. 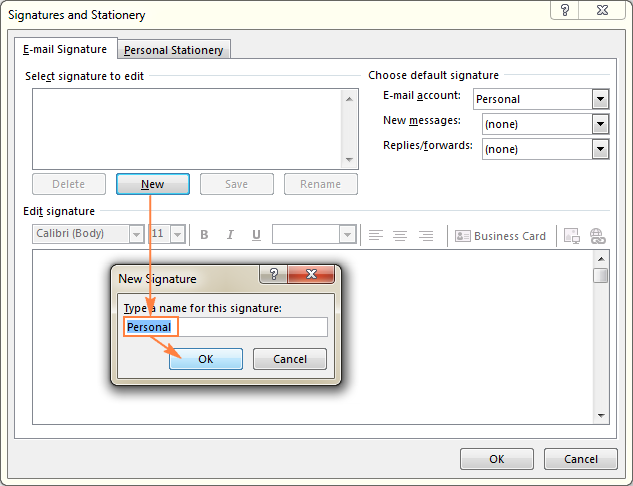 As you remember, these options reside under the Choose default signature section of the Signatures and Stationery dialog window and are available when creating a new Outlook signature or changing the existing signature. For example, in the following screenshot, I set up a signature for my 'Sales' account, and choose Formal signature for new messages and Short signature for replies and forwards. If you want to create a different signature for messages that you Reply to, Reply All or Forward, you can use our Template Phrases for Outlook add-in. The primary purpose of this add-in is to help Outlook users instantly reply to emails with templates. In addition, this tool lets you assign keyboard shortcuts to most frequently used templates, and automatically add a signature to different email types. 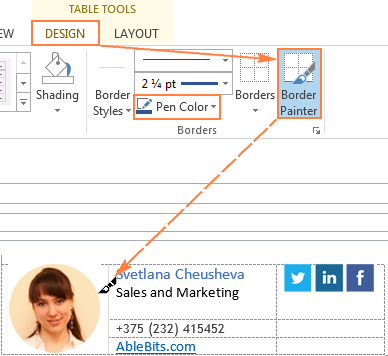 Select your signature in an email and click the New Template icon on the Template Phrases toolbar to create a new template with your signature. That's it! From now on, the selected email signature will be added to the specified message types automatically. To see the Template Phrases add-in in action, you are welcome to download a fully functional trial version. To rename an Outlook signature, click on the signature under Select signature to edit, and click the Rename The Rename Signature box will show up, where you type a new name, and click OK to save the changes. 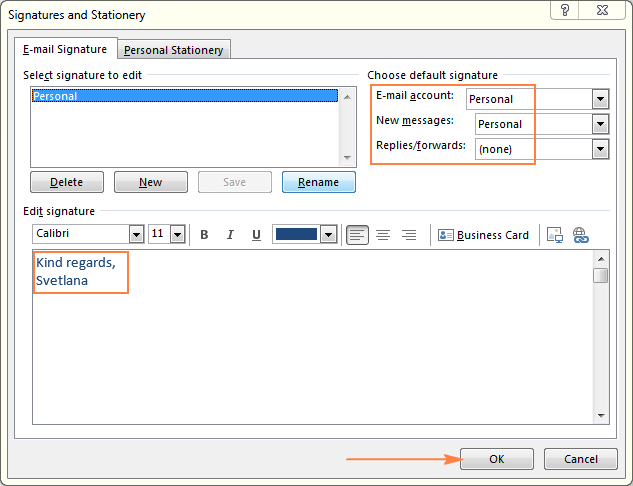 To change an email account associated with the signature, or change the message type (new messages, replies/forwards), use the corresponding dropdown list under Choose default signature in the right-hand part of the Signatures and Stationery dialog window. If you are communicating with a lot of people outside of your organization, you may want to personalize your email signature by adding your company logo, your personal photo, social media icons, a scanned image of your handwritten signature, or other picture. As everything else related to Outlook signatures, adding an image is very easy and straightforward. Open the Signatures and Stationery dialog window (as you remember that fastest way is to click New Email on the Home tab, and then click Signature > Signatures… on the Message tab). Under Select signature to edit, click the signature to which you want to add an image, or click the New button to create a new signature. In the Edit signature box, click where you want to add an image, and then click the Insert a picture button on the toolbar. Browse for a logo, social media icon or other image that you want to add to your Outlook email signature, select it, and click the Insert button. 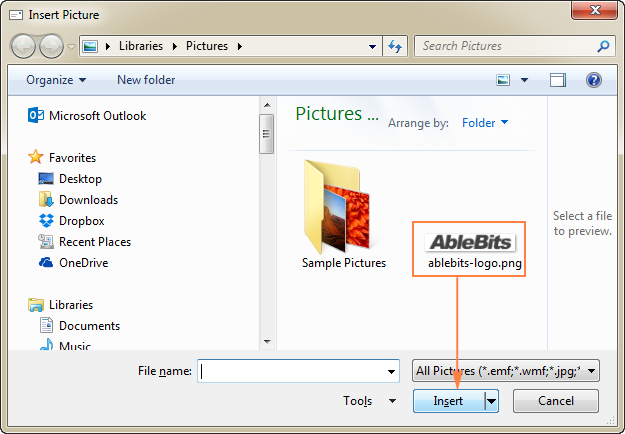 Outlook allows adding pictures in the following formats: .png, .jpg, .bmp, and .gif. Click OK to finish creating your Outlook signature with image. If instead of (or along with) your company logo, you added social media icons, obviously you would want to link those icons to the corresponding profiles, and the next section explains how to do it. Naturally, nothing prevents you from adding a link to your web-site by typing it in full. But the company name that links to your corporate web-site will definitely look nicer. In the Edit signature box, select the text, and click the Hyperlink button on the toolbar. If the hyperlink text is not added to the signature yet, you can simply place the mouse pointer to where you want to add a link, and click the Hyperlink button. In the Text to display box, type the text you want to make clickable (if you've selected any text prior to clicking the Hyperlink button, that text will appear in the box automatically). In the Address box, type the full URL. In the Signatures and Stationery window, click OK to save the changes. In the Edit signature box, select the logo, and click the Hyperlink button on the toolbar. In the Insert Hyperlink window, just type or paste the URL to the Address box and click OK.
That's it! Your brand logo has become clickable via a hyperlink. In a similar fashion, you can add links to social media icons such as LinkedIn, Facebook, Twitter, YouTube, etc. 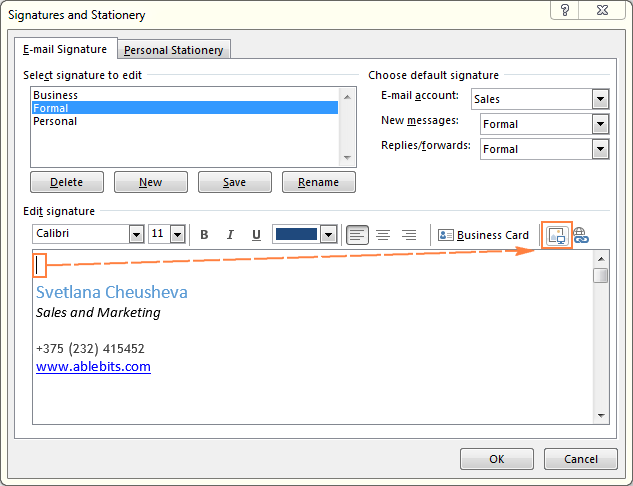 Another quick way to create a signature in Outlook is to include a business card (vCard) that contains your contact information. Because business cards are created by Outlook automatically based on contacts stored in your address book, be sure to create your own contact first. For this, click People at the bottom of the screen in Outlook 2013, 2016 and 2019 (Contacts in Outlook 2010 and earlier), go to the Home tab > New group, and click New Contact. The major part of the work is done! 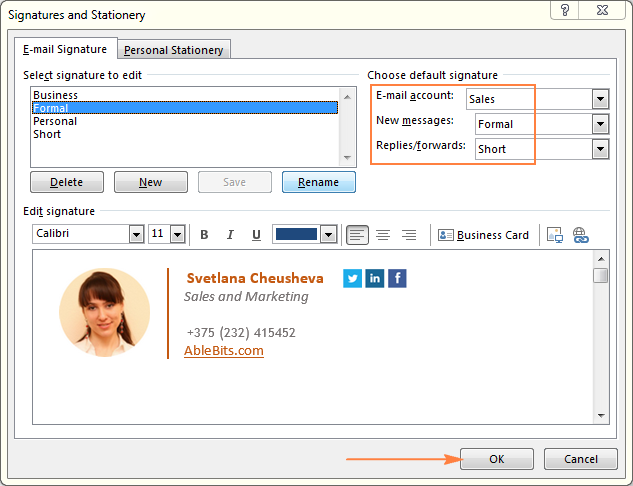 And now, create a new Outlook signature, and click the Business Card button on the mini toolbar as shown in the below screenshot. This will display your list of Outlook contacts, where you choose your own contact and click OK. This section provides detailed step-by-step instructions on how to create a more complex email signature, that includes your contact information, photo and social medial icons with links to corresponding profile pages. Because the Outlook signature mini toolbar provides a limited number of options, we are going to create a signature in a new message, and then copy it to Outlook Signatures. Create a new message by clicking the New Email button on the Home tab. Insert a table to hold and alight your contact details and images. In the new message window, switch to the Insert tab, click Table, and drag your cursor in the table grid to select the number of rows and columns corresponding to your email signature layout. 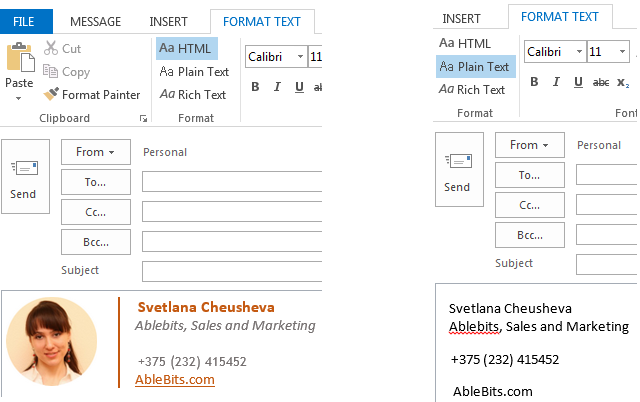 The table will help you align your graphic and text elements and bring harmony to your Outlook email signature design. If you are not sure how many rows and columns you will actually need, you can add 3 rows and 3 columns like we do in this example, and add new or delete extra rows/columns later if needed. Insert your brand logo or personal photo in some cell of the table (first cell in this example). To do this, put the cursor into the cell where you want to add an image, and click the Pictures button on the Insert tab. Browse for an image on your computer, select it, and click the Insert button. Drag a diagonal double-headed arrow in the corner of your image to proportionally resize the image if needed. If you don't plan to include any other graphic or text elements in the first column, erase the unnecessary row borders. For this, switch to the Layout tab > Draw group, and click the Eraser button. This will let you arrange the image in any position within the first column by using the Alignment options on the Layout tab. If you want to include the social media icons in your signature, you can grab them from this page. Simply right click the below icons one by one, and click Save image as… to save each icon individually on your computer as a .png picture. Add hyperlinks where appropriate. For example, to make the social media icons in your Outlook signature clickable, right-click each icon individually, and click Hyperlink. In the Insert Hyperlink dialog box, type or paste the URL and click OK. In a similar manner, you can add a hyperlink to your company logo, or other graphic and text elements. 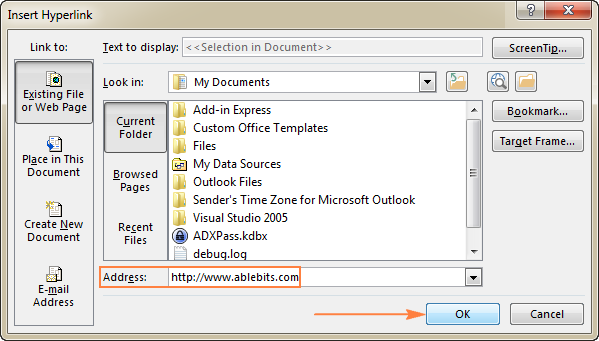 For example, you can type a short name of your web-site (AbleBits.com in this example), select it, right-click, choose Hyperlink from the context menu and type the full URL to make that short link clickable. Drag to resize the table columns to remove or add extra room in cells. Our Outlook email signature is almost finished, and we can get rid of the table borders. Be sure to select the whole table, then go to the Design tab, click Borders, and select No Border. To make the dividers thinner or thicker, experiment with different Line Styles and Line weights (these options reside right above the Pen Color on the Design tab in the Borders group). When you are happy with the design of your Outlook email signature, select the entire table, and copy it by pressing Ctrl + C, or right-click and select Copy from the context menu. Finally, set up a new signature in Outlook by going to the Insert tab and clicking Signature > Signatures… (if you need the detailed instructions, here you go: How to create signature in Outlook). Need more inspiration? Check out 15 tips to create professional email signature with examples. After you've created your beautiful Outlook email signatures, you'll probably want to back them up or export to another computer. As already mentioned, nearly everything related to Outlook signatures is very easy to do. The backup process is not an exception. You just need to copy the entire contents of the Signatures folder to your backup location. To restore your Outlook email signatures, simply copy those files and folders back into the Signatures folder on your computer. When creating an HTML email signature with your custom colors, images and links, be aware that it may not appear the way you designed it for everyone. While you can do nothing about formatting, your brand logo or personal photo because the plain text format doesn't support any of this, you can at least fix your hyperlinks containing the relevant information. When I say "fix", I mean make the full URL appear in the plain text version of your html Outlook signature. To edit just a plain text signature, open the corresponding .txt file directly in the Signatures folder, and make the required changes. The detailed steps follow below. Open your Signatures folder as explained here. Save the modified file (Ctrl + S shortcut works nicely in most applications), and you are done! Tip. I strongly recommend to make a backup of your Outlook signatures afterwards, because the edits you've made in the plain text signature will be overwritten once you change your original html signature in Outlook. The good news is that there exist plenty of online email signature generators that offer a selection of beautifully designed email signature templates. The bad news is that very few of those generators allow exporting their email signatures to Outlook for free. In our previous article, you can find a quick overview of 4 most popular email signature generators, and 3 of them let you export your custom html signatures to any email client, including Microsoft Outlook, free of charge. 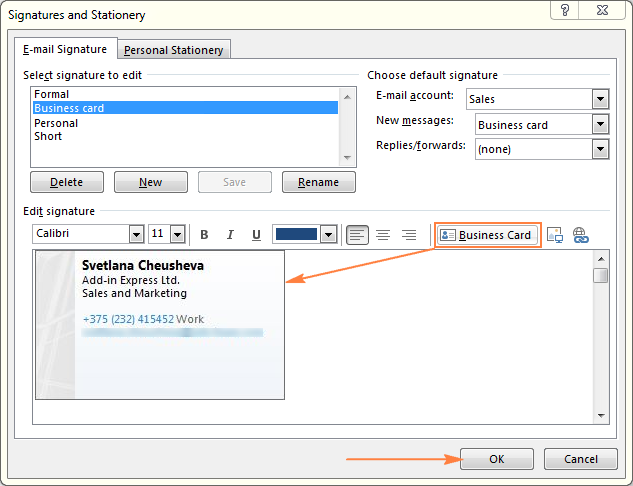 Exclaimer Signature Manager - email signature software solution for Microsoft Outlook 2016, 2013, 2010, 2007, 2003 and OWA. It provides a number of email signature templates that let you create professional Outlook signatures that combine static text with images and dynamic data. Xink - makes it easy to update your email signatures across different email clients such as Outlook, Office 365, Google Apps for Work, Salesforce and others. 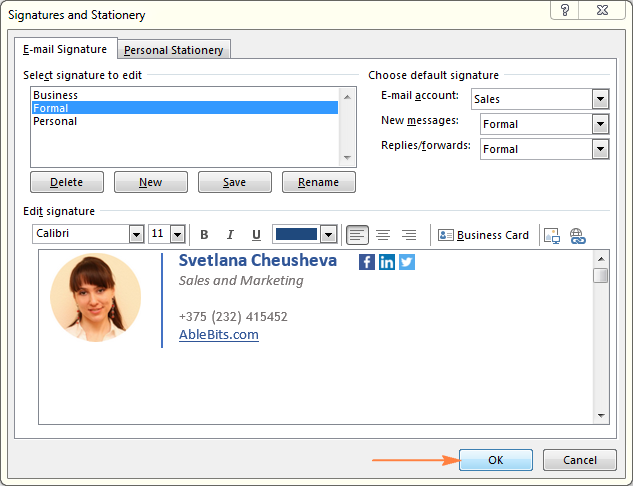 Signature-Switch - an Outlook add-on that improves use of HTML-based signatures. All three are paid tools, though trial versions are available. This is how you create, add and change signatures in Outlook. And now, it's over to you! Have fun designing your brand new Outlook signature, keep fonts readable, colors nice, graphics simple, and you will certainly leave a great lasting impression on all of your email recipients. 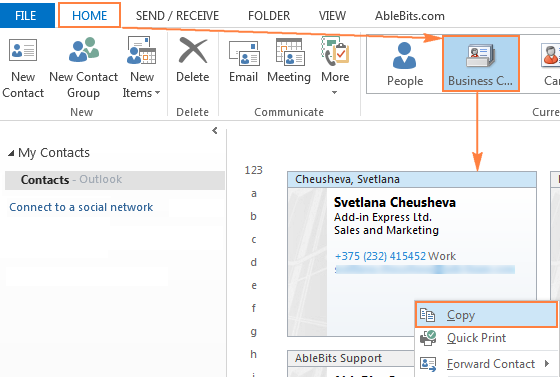 11 Responses to "How to create, add and change signature in Outlook 2019, 2016 and 2013"
I have a data in which first row contains date and other three rows contains their pageviews, visits. I need your help to merge date wise data in which i can the total visits pageviews and as well as visitors for all dates seperately this database contains 4700 rows. Below are the example of data. Where column A is the column containing dates, and B is the column to sum. For more information, please see SUMIF in Excel - formula examples to conditionally sum cells. This article has been a great help! My only issue is that the table, even when I choose no border, or make it a white border, still shows up with black lines when I paste it into the Signatures tab. Any idea what might be happening? I'm on Outlook 2010 currently. Thanks! I've never had such an issue. It may sound obvious, but did you select the entire table before changing the borders? I do not know if you solved already this issue, if not, know that I have got the same exactly problem when inserting my new table signature in Outlook 2010. 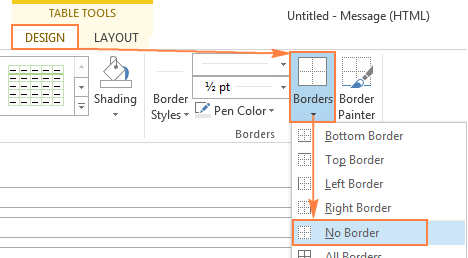 But after trying several times I accidentally found a way to make the border disappear: when inside the signature's editing box on Outlook [signatures & stationery],select the white colour on the edit bar and the black border disappears! Try also to do the same in the initial page [new message] where you have created your signature. This may prevent the black border to show out. *This tutorial is really GREAT! It's detailed and a rich source of info. Thanks a lot Svetlana! I didn't even know that Outlook has so many useful options. I really like the part about tables in the signature. Before that I had no idea how other people are able to put their data horizontally, and not vertically like I did. At this moment I also use signature generator (I am adding link if anyone is curious: https://www.mail-signatures.com/signature-generator/) because it prepares a ready-to-use signature for me. Thank you for this article, it's been very helpful and has helped me solve an issue I've been wrecking my brain over all week. 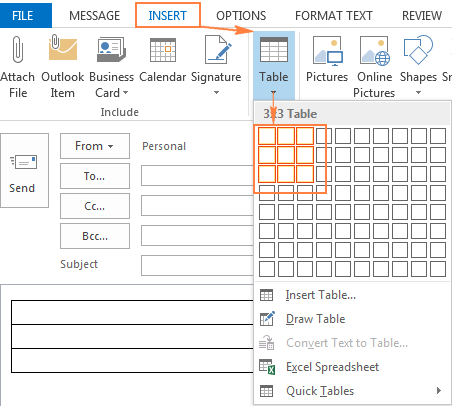 I have a follow-up question; I've created a three-column table signature in Outlook 2013. It looks good on desktops, using different email services and browsers. But on mobile the table gets condensed, and some lines get broken in to. How can I solve this? I cannot say for sure why this happens without seeing your signature. Most likely you just need to fix the columns' width (select the table, right-click, AutoFit > Fixed Column Width). Any quick easy ways to add a time sent stamp to a signature block?